Nothing makes a shoe more dazzling than metallics and Jolene fits the bill. 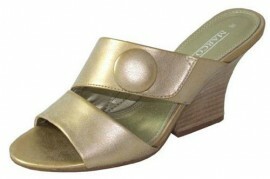 Imitation leather gold evening sandal with a 3" wedge heel & padded insole. Gold evening sandals are perfect for day or evening.